The Birck Boilermaker Golf Complex offers the latest golf equipment from all the top manufacturers along with complete club fitting and club repair services. Click here to contact us about your custom club fitting or repair needs. The Birck Boilermaker Golf Complex is pleased to offer the latest in golf club technology and the best part is that we will custom fit the clubs to fit your swing! 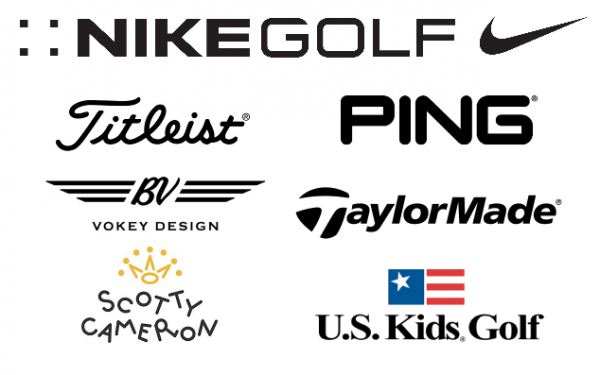 Please visit the Driving Range Golf Shop for more information on golf equipment from these top equipment manufacturers. You can buy “custom” golf clubs at any retail store but custom golf clubs are simply clubs that have at least one specification that is different from "standard". Therefore, any set of clubs which you purchase that are not “standard” (eg, 1 degree upright or ½ inch long irons) are “custom” clubs. What you don't have, in this case, are "CUSTOM FIT" golf clubs. Custom fit golf clubs are matched to your specific needs as determined by a qualified clubfitter during our fitting process. After a BBGC custom fitting, your clubs will no longer "be a part of the problem", instead they will be tailored to, and complement, your golf swing. Even if your clubs are relatively new, if you have not had them custom fit, it is more than likely that they are not set-up to provide optimum performance for you. Furthermore, even clubs which have been custom fit will need to be checked from time-to-time. (Your swing evolves and loft and lie can change so an annual assessment is a wise investment.) Whether you wish to adjust (or modify) your existing clubs or purchase new clubs, the process described below will ultimately lead to the best custom fit clubs for you. Click here to contact us about your custom club fitting needs. Click here to contact us about your custom club fitting needs. The custom fitting process starts with an interview covering all aspects of your golf game. By completing the interview you provide us with a wealth of information, including, current state of your golf game, short term and long term goals, ball flight patterns, and your perceived strengths and weaknesses. You will also provide us with an inventory of your existing equipment. This interview is usually completed well before, and becomes the basis of, our live fitting session. Your current equipment is evaluated to establish a baseline of as many of the key club characteristics (loft, lie, length, total weight, shaft weight, shaft flex, grip size, swingweight, offset, and face angle) as possible. Precision state-of-the art measuring equipment is used to evaluate your current set in our fully outfitted repair shop. Your physical height and wrist-to-ground measurements, along with hand measurements will be taken at this time. Your club and physical measurements aid in determining whether there are compensations which you may be making in your swing because of your equipment. Inconsistent club parameters (particularly lie angle and length) are the key reason for inconsistent club-to-club performance. Thus, a golfer seems to be able to hit most of the set well, but has problems with the rest. Factoring in your opinion and attitude toward your current clubs will provide us with a starting point. Our clubfitter will then observe your swing and ball flight patterns while you hit some balls with your existing clubs to establish how well they fit your ability level, your swing and your swing tempo. In addition face impact information will be used to establish whether length and lie are correct. At this point, recommendations will be made by our clubfitter as to whether, or not, modifications to your existing clubs would improve your game. Should you choose the modification route, a detailed estimate of cost and plan of action will be provided. Should you be interested in a new driver, new irons, or a new full set of clubs, the clubfitter, after an abbreviated existing equipment assessment will, based on your ability level and swing tempo, select the type of clubhead and shaft as a starting point for the fitting. Our clubfitter, for each case, will then observe your swing and ball flight patterns while you hit some balls with the selected clubhead and shaft to establish how well they fit your ability level, your swing and your swing tempo. In addition face impact information will be used to fine tune the club for proper length and lie. During the next portion of your fitting, you will hit balls monitored by the FlightScope® Launch Monitor. FlightScope® is an ideal tool for custom club fitting. It provides accurate ball flight and clubhead travel information. It also provides the clubfitter with information to help determine when a player is fitted with the shaft which matches the manner in which the golfer loads the shaft during the swing. The clubhead Acceleration Profile provides an instantaneous measure of the quality of the fit of the golf shaft for the player being tested. Accurate club and ball speeds, shot shape, launch angles, carry distance and spin rates comprise the dataset required in order to perform a custom fitting procedure. The clubfitter, based upon real-time FlightScope® data will determine appropriate shaft type and flex. After optimizing shaft type and flex, additional trials will further optimize club length and lie angle. These results will form the basis of a “custom fit” for your swing. Specific (shaft model and flex, length, lie, loft, weight) recommendations for new equipment will then be made. If the fitting is for a full set, a recommendation will be made pertaining to set makeup. The correct combination of clubs will maximize your ability to score. With the variety of high loft fairway woods, hybrids, and different combinations of wedges available, you can have a set matched to your particular strengths. A set of specifications will be provided to you for your reference. If you order clubs through BBGC, we will use those specifications to check your clubs when they arrive. At some point, either for your existing clubs or for new clubs, you will want to fine tune your distance gaps between clubs. During the Gap fitting, you will hit balls monitored by the FlightScope® Launch Monitor. Accurate distance and dispersion information will be collected and form the basis for adjusting club loft angles (included in the cost of the fitting) to provide the distance gaps ideal for you. You will be provided with a complete set of specifications for future reference. Get Your Clubs Repaired or Adjusted Here! Are your grips so worn that your club is slipping in your hands during your swing? Have you always wanted to replace that stiff shaft you have in your driver with a regular shaft? Are the distance gaps between your irons not uniform? The Birck Boilermaker Golf Complex is the only local facility that offers complete club repair services by a Master Club Performance Specialist. 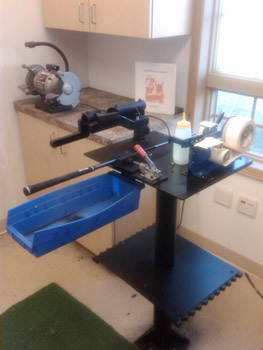 From re-gripping, to re-shafting, to loft, lie and length adjustment, we have the latest state-of-the-art equipment to repair or adjust your clubs, making the Birck Boilermaker Golf Complex the most convenient and economical place to go for your club repair needs. Please stop by or call the Driving Range Golf Shop at (765) 494-3139 ext 2. ** Not all grips can be saved and not all club heads are bendable. Our club repair specialist will advise you if yours are not. Additionally, some grips/club heads may fail during saving/bending due to age/metallurgical defects. The customer must accept the risk of grip/club failure before repair is attempted. Want to put in a club repair order? Just looking for more information on services we provide? Please complete the form below.